With preschool, dance, gymnastics and sports wrapping up for the school year, you’re probably being faced with the age old question, “What do I get for my children’s teachers?” If your children have many teachers, aides and coaches that you need to get “a little something” for, the thought can be daunting—and downright expensive once you add it all up! Today I’m sharing some fun and thoughtful teacher gift ideas, both large and small, and some ways to personalize them for those special role models in your kids’ lives. 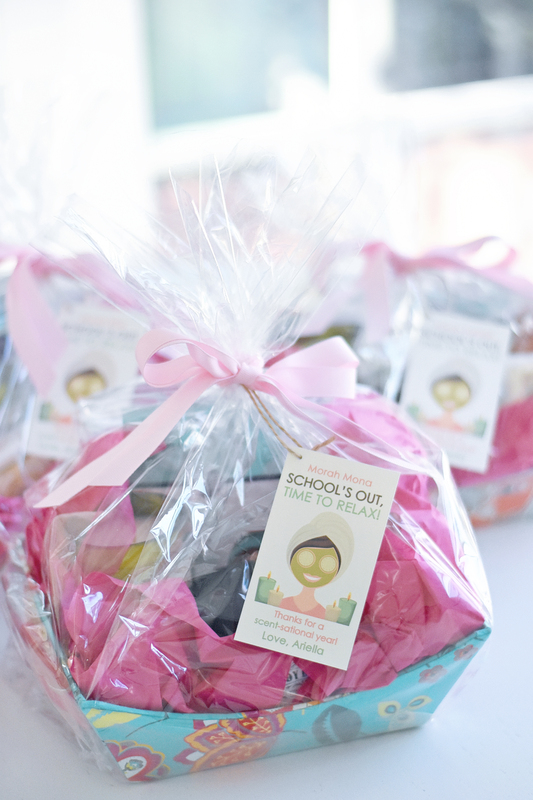 What better way to pamper your child’s teacher after a long year with a bunch of crazy kids than with a spa basket full of rest and relaxation? To make a spa gift basket of your own, first start with a gorgeous gift basket—they come in all kinds of colors and lovely patterns and look great with the spa products. Some products you could include are: lavender bath salts, bubble bath, cucumber eye cooling pads, lavender candle, almond soap, hydrating bath lotion, foot pumice stone, hand cream, mini facial kits, spa bath pillow, eucalyptus and mint body wash, terry headband and spa slippers. Another inexpensive but thoughtful gift idea is a potted succulent. I added a gift card to each one as an additional thank you. Trader Joe’s has a great selection of perfectly size potted succulents this time of year. I found these adorable felt watering can gift bags, and the succulents fit perfectly inside. I then chose some coordinating gift tags, glued them to lollipop sticks and stuck them inside each pot. Another sweet idea is to make pedicure and manicure gift sets. Include a few nail polishes, toe separators, a nail file and an iTunes or Starbucks gift card and package everything in a clear plastic goody bag with a bright ribbon. I used two different printable tag designs—Toe-Tally Awesome and Mani Thanks. My kids loved picking out the nail polish colors specifically for their favorite teachers. These little packages are perfect for school aides, dance teachers and anyone else to whom you want to show appreciation! Is the spa gift tag downloadable?